This tapestry "Woods & Stream" shows a scene of the forest, based on the originals commissioned by King Augustus of Poland from the 16th century. Originally created for King Sigismund Augustus (1520-1572) was passionate about tapestries and jewelry, and collected over 360 tapestries in his palace created in Brussels, called the Jagaloon or Jagiellonian series. These tapestries became the possession of the Crown of Kingdom of Poland. This verdure with animals tapestry is based on a work from Jan van Tieghem's workshop, from around 1555. Here we see swans swimming in the lake of the forest surrounded by an abundance of trees and foliage. 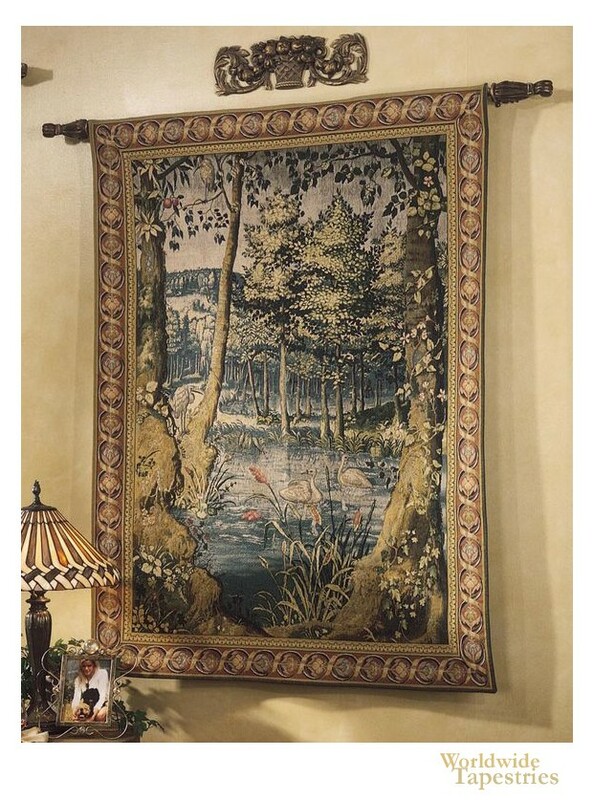 This Belgian landscape tapestry "Woods & Stream" is backed with a lining and has a tunnel for easy hanging. Note: tapestry rod and accessories, where pictured, are not included in the price. Dimensions: W 48" x H 65"